Every year, the results of contests on “The Worst Bosses of The Year” are published, and it never ceases to amaze me how truly badly some people “mis-manage” others. I wish it could be said that management of knowledge workers (see Knowledge Is Power!) is different from the rest of the world, but, alas, that is not true. 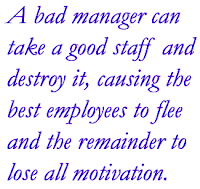 Knowledge worker-based organizations have more than their fair share of horrendous managers. There is, however, a difference in the impact of bad managers on knowledge worker-based organizations from that on some other types of organizations. Since the managers in knowledge worker-based organizations “manage” knowledge workers, and knowledge workers really are different from other people (see Herding Cats: The Art of “Managing” Knowledge Workers), bad managers can truly poison the well in a knowledge worker-based organization and virtually destroy the morale and effectiveness of that organization. Further, since knowledge workers tend to be in higher demand and are able to bring their skills more readily to other companies without such bad managers, companies with bad managers tend to lose their knowledge workers, and with their loss, the intellectual knowledge and strength of the organization goes out the door with them. 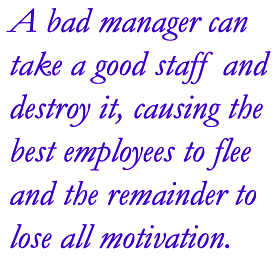 With bad management, the best and brightest knowledge workers are typically the first to go, because they simply refuse to put up with the garbage that bad managers hand them; they know they will be in high demand elsewhere. And the remainder tend to lose all motivation. So, since good and effective Managers are truly critical to knowledge worker-based organizations, the Managers of those Managers must clearly recognize this, right? One would certainly think so, but this is often not the case. How, then, do Mis-Managers find their way into the leadership and managerial roles in knowledge worker-based organizations?